The mass grave along with a truck. 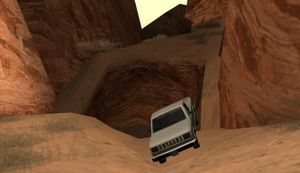 The mass grave is a pit located at the foot of a mesa in El Castillo del Diablo, Bone County, north of the Restricted Area and south of the Verdant Meadows aircraft graveyard in Grand Theft Auto: San Andreas. The pit, which takes the form of a large round hole, contains six body bags, and a Bobcat truck and shovel pickup next to the pit. The grave could be a place for the Families to dispose of bodies, as two Sindacco Family thugs depicted in "The Introduction" are seen in the desert digging a grave to dispose of one person, not six - possibly indicating that more people were buried there during the events of GTA San Andreas. The location of the Mass Grave pointed out in a map. The body bags inside the mass grave. This page was last modified on 23 January 2013, at 07:32.